This is the actual software license that you need to get in order to use the SpeedPix program [beyond any free trial you may have had]. You can use this license key on a single device. The fee for this license key does not include any upgrades to future versions, however people using any previously purchased version are entitled to a substantial discount when the next version becomes available. 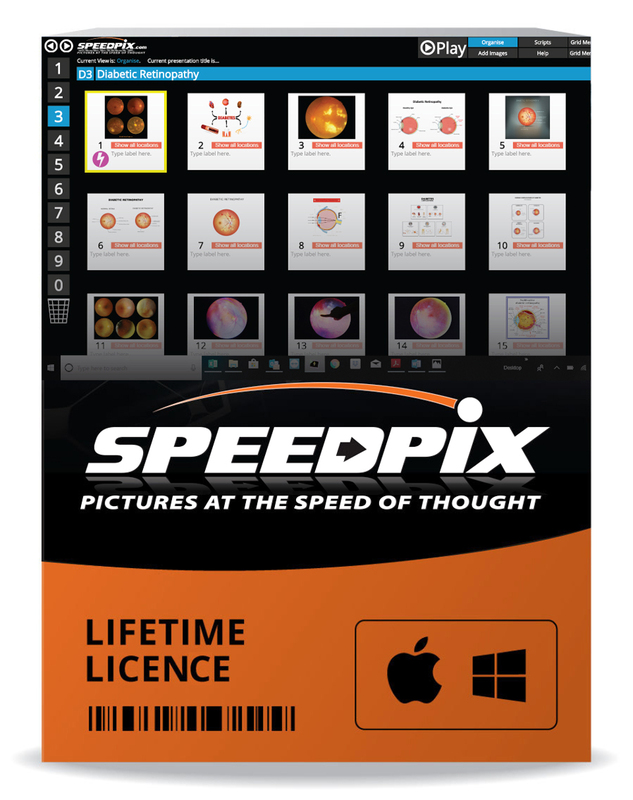 The SpeedPix license key also entitles you to free support via the website for the first 12 months from the date of purchase. The license key also entitles you to get 10% off the recommended retail price of our SpeedPix stands, support arms and display systems. Help other SOUTH PACIFIC SOFTWARE PTY LTD users shop smarter by writing reviews for products you have purchased. This End User Software Licence Agreement (the “EULA”) is a contract between South Pacific Software Pty Ltd., ABN 70 610 481 242 of Unit 5, 224 Headland Road, North Curl Curl. NSW 2099 Australia. (the “Licensor”) the user of the Software (the “End User”). The Licensor and the End User together will be referred to as the “Parties” and individually will be referred to as a “Party”. By installing or using the Software, the End User accepts all of the terms and conditions set out in this EULA. If the End User does not wish to be legally bound by the terms and conditions of this EULA, then do not install or use the Software. Software has the meaning set out in Item 3 of Schedule 1. (f) reference to any agreement or other document annexed to or referred to in this EULA includes any amendments to it and any documents in addition to or in substitution for it which has been approved in writing by the parties to this EULA. with the licence effective from the Purchase Date. 2.2 Transfer of licence: The End User may only transfer the licence granted by Clause 2.1 as part of the sale of the business of the End User. 2.3 Licence of object code version of the Software: The license granted by Clause 2.1 applies only to the object code version of the Software. The End User will have no rights whatsoever with respect to the source code for the Software. 2.4 Reservation of rights: Except for the licence explicitly granted by Clause 2.1, the Licensor reserves all its rights. The End User acknowledges and agrees that the End User is licensed to use the Software only in accordance with the express provisions of this EULA. 2.5 Evaluation licence: If the End User receives the Software as an evaluation copy, the End User may only use the Software for the period of time set out in Item 4 of Schedule 1. A software key may be embedded in the Software to limit the evaluation period so that the Software will become in-operable when the evaluation period expires. 3.1 The End User will not reverse assemble or reverse compile or directly or indirectly allow or cause a third party to reverse assemble or reverse compile the whole or any part of the Software. 3.2 No provision of this Agreement will be interpreted as attempting to exclude or limit, or having the effect of excluding or limiting, the operation of such s 47B(3) or of s 47C, 47D, 47E or 47F, of the Copyright Act 1968 (Cth). Any provision which is inconsistent with any such sub section or section will be read down or otherwise deemed to be varied to the extent necessary to preserve the operation of such subsection, section or sections. 3.3 The End User will not (a) make more copies than the number of installations of the Software described in the Ordering Document (except for a reasonable number of copies for back up and disaster recovery purposes) or use any unlicensed versions of the Software; (b) use the Software in connection with hazardous activities, or any activity for which failure of the Software might result in death, bodily injury or psychiatric injury to the End User, its employees, independent contractors, agents, customers or any member of the public. 4.1 Download of Software from website: The End User may download the Software from the Licensor’s website, with payment of any Licence Fee due at the time of downloading the Software in accordance with the payment system set out in the Ordering Document. The Software will be delivered electronically, and delivery will be deemed complete when the Software is made available to the End User. 4.2 Payment terms: All payments due under this EULA are exclusive of GST, which where applicable will be paid by the End User to the Licensor in addition at the rate and in the manner prescribed by applicable law. 5.1 Software upgrades: The Licensor may upgrade or update the Software and if the End User discovers a material error in the functionality of the Software which substantially affects the End User’s use of the Software and the End User notifies the Licensor of such material error, the Licensor will use reasonable endeavours to correct, by patch or new release (at the Licensor’s option), that part of the Software which is affected by such material error, provided that the Licensor may decide to stop providing upgrades, updates or bug-fixes for the Software. 5.2 Support services: Support for the Software and assistance in relation to the operation of the Software will be supplied to End Users on the Licensor’s website, with assistance the End Users delivered by email, provided that Licensor may decide to stop delivering support or maintenance services in relation to the Software. 5.3 Limits to the supply of support services: The Licensor may, at its sole discretion, not provide software upgrades or support services under Clauses 5.1 & 5.2 in the following circumstances: (a) where the Software has not been used or maintained in accordance with any instructions or recommendations given by the Licensor; (b) where the problem arises from software not supplied by the Licensor; (c) where the Software is used other than in the correct configuration; and/or (d) following any unauthorised use of or modification to the Software. 5.4 Viruses: The Licensor does not warrant that the Software supplied under this EULA will be free from all viruses. The End User acknowledges and agrees that it is solely the End User’s responsibility to conduct appropriate virus scanning of the Software prior to installation and use. 6.1 Use of Registered Trade Marks: The End User’s license to use the Registered Trade Marks is limited to their reproduction in the graphical user interface (“GUI”) of the Software and on any Documentation. The End User must not alter, remove or obliterate any proprietary notices incorporated in or affixed to the Software or Documentation. 6.2 IP warranty: The Licensor warrants that the use of the Software and Registered Trade Marks according to the terms and conditions of this EULA will not result in the infringement of rights of third parties. 7.1 Limited Warranty and disclaimer: Subject to clauses 7.2 & 7.3, The Licensor guarantees that for one year from the Purchase Date, the Software will perform as described in the Documentation, as long as the End User uses the Software in accordance with the instruction or recommendations set out in the Documentation. Except as set out in the previous sentence, the Software is provided "as is" and the Licensor will not be held responsible and the Licensor expressly disclaim any liability whatsoever for any claims, demands or damages, direct or indirect, of every kind and nature, arising out of or in any way connected with use of the Software. Without limiting the scope of the preceding sentence, the Licensor gives no warranty or guarantee that the Software will meet the End User’s requirements, that the the Software will be error-free and operate without interuption, or that any errors or defects in the Software can or will be corrected. (e) the Licensor will in no circumstances be liable for any type of special, indirect or consequential loss, for any loss of profit, revenue, or anticipated saving, loss or corruption of data, interruption of business, loss of use, loss of contracts with third parties, loss of business or loss of goodwill, even if such loss was reasonably foreseeable or the Licensor had been advised of the possibility of the same arising. 7.3 Choice of remedies: Where any condition, warranty or right is implied by law, or statutory consumer guarantee cannot be excluded, the Licensor limits its liability for breach of, or other act contrary to, that implied condition, warranty or right or statutory consumer guarantee, either as provided under section 64A of the Australian Consumer Law in Schedule 2 to the Competition and Consumer Act 2010 or, otherwise to the extent permitted by law. In particular, to the extent possible, the Licensor limits its liability in respect of any claim to, at its option: (a) in the case of goods: (i) the replacement of the goods or the supply of equivalent goods; (ii) the repair of the goods; (iii) the payment of the cost of replacing the goods or of acquiring equivalent goods; or (iv) the payment of having the goods repaired, and (b) in the case of services: (i) the supply of the services again; or (ii) the payment of the cost of having the services supplied again. The Licensor’s maximum aggregate liability to the End User is limited to the total Licence Fee the End User has paid the Licensor in respect of the Software. 7.4 EU resident’s right of withdrawal on software sales: European law principally provides a right of withdrawal in respect of software sales that can be excluded for digitally provided content. Therefore, if the End User is domiciled in a country of the European Union (EU), the EU statutory right of withdrawal ends 14 days after the purchase of the Software or the moment the End User start downloading the Software for the first time (whichever is sooner). 8.1 Indemnity: The End User will indemnify the Licensor and its affiliates, subsidiaries and related body corporates and their directors, officers, employees and agents (“those Indemnified”) from and against any and all claims, demands, losses, liabilities, damages (including but not limited to direct, indirect, consequential, special, exemplary or punitive damages), costs, expenses and legal fees of any nature whatsoever that may be asserted against or suffered by the Licensor and which relate to: (a) any use by the End User of the Software; and/or (b) the development, manufacture, use, supply, or any other dealing in any products or services that were generated from the use of the Software, including any claims based on the Australian Consumer Law or the product liability laws of any other applicable jurisdiction; and/or (c) breach of this EULA. 9.1 No partnership or agency relationship: Nothing contained in this EULA will be deemed to constitute partnership between the parties and nothing contained in this EULA will deem either party to be the agent of the other party and the End User must not hold itself out as, engage in any conduct or make any representation which may suggest to any person that the End User is for any purposes, the agent of the Licensor. 9.2 Entire agreement: This EULA, and any terms which are incorporated by written reference, including terms or conditions contained in any Ordering Document, constitutes the entire agreement between the parties with respect to the use of the Software, and replaces all previous communications, representations, inducements, undertakings, agreements and arrangements between the parties in respect of its subject matter and this EULA may not be modified except by written agreement signed by each party. 9.3 No waiver: Failure to exercise, or any delay in exercising, any right, power or remedy by a party does not operate as a waiver or abandonment of the right, power or remedy. A single or partial exercise of any right, power or remedy does not preclude any further exercise of that or any other right, power or remedy. A waiver is not valid or binding on the party granting that waiver unless made in writing. 9.4 Severance: If any provision of this EULA is void, illegal or unenforceable, it may be severed without affecting the enforceability of the other provisions in this EULA. 9.5 Jurisdiction: This EULA is subject to the laws of the state or territory described in Item 5 of Schedule 1 with the courts of the state or territory described in Schedule 1 having exclusive jurisdiction over any disputes arising in respect of this EULA. Item 1 Designated Operating Environment: The End User is licensed to use the Software on up to 5 devices of the End User e.g. office or home workstation, laptop, tablet computer, mobile phone. 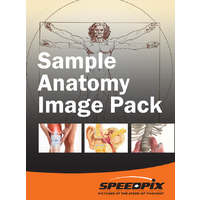 Item 3 Software: SpeedPix presentation software for patient education and sales presentation and other uses. Item 4 Term of evaluation licence: 60 days. Item 5 Jurisdiction: New South Wales, Australia. The Customer placing an order with the Seller to acquire any Computer Hardware. A. 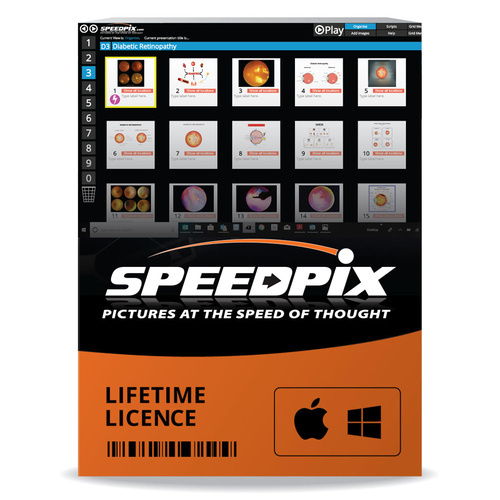 South Pacific Software Pty Ltd operates an online platform through a website (Website) for the supply of Computer Hardware and computer programs, including the SpeedPix App. B. By using our Website you agree that you are is subject to these terms of supply. Please read them carefully each time you use our Website to order Computer Hardware as we may from time to time amend these terms of trade without prior notice. C. By placing an order for the supply of Computer Hardware from our Website, you agree that these terms of supply will, in all circumstances, prevail any terms and conditions contained in quotes, invoices or other documentation exchanged between the parties whether or not such documentation expressly provide that they override these terms and conditions; including, without limitation, any terms and conditions attached or forming part of any purchase order delivered by you to us. you and your means the Customer. 2.1 You agree to the following terms and conditions of sale by the placement of an order with us to purchase Computer Hardware. 3.1 Any price list we make available to you, or pricing information contained on the Website or any quotation provided by us is not an offer or obligation to sell to you and we reserve the right to accept or reject, in our absolute discretion, any purchase orders you may deliver to us. 3.2 Each amount payable by you under these terms of supply of Computer Hardware in respect of a “taxable supply” (as defined in the GST Act) by us is a GST exclusive amount and you must, in addition to that amount and at the same time, pay the GST due in respect of that supply. We will usually insist upon cleared payment being received by use before we deliver the Computer Hardware to you. 3.3 We reserve the right to refuse or cancel any orders placed. If the order had been confirmed and charged to your credit card or bank account, we will immediately issue a refund. 4.1 We place great importance on the fast and reliable delivery of Customer’s orders, however please note that delivery times are estimates only and we will not be liable for delays in delivery of the Computer Hardware. The Computer Hardware will be at your risk for loss or damage at the point of delivery. 5.1 Except to the extent otherwise required by law, all returns of any Computer Hardware where there has been no breach of either: (a) these terms and conditions; and (b) an applicable Consumer Guarantee, must be approved in writing by us. 5.2 We reserve the discretion to accept or reject requests for return of any Computer Hardware where we are not in breach of either: (a) these terms and conditions; or (b) any applicable Consumer Guarantee. 5.3 Any Computer Hardware that we approve as returned Computer Hardware must be freight prepaid by you. Approved returned Computer Hardware remains at your risk as to loss or damage until such time as the returned Computer Hardware arrives at our place of business. 6.1 Our Computer Hardware usually come with warranties from the manufacturer. Your rights under these warranties are governed by the specific terms of the manufacturer’s warranty. We have no liability to you in respect of the manufacturer’s warranty. 7.1 Except where you are a Consumer, to the full extent permitted by law and subject to any implied condition, warranty or right, which cannot be excluded by law: (1) we exclude all representations, warranties or terms (whether express or implied) other than those expressly set out in this Agreement; (2) we are not liable for any loss (including special, indirect or consequential loss, loss of profits or revenue, loss of business, loss of reputation, loss of goodwill, loss of opportunity arising or loss caused by our negligence) or damages (including but not limited to direct, indirect, consequential, special, exemplary or punitive damages) suffered or incurred by you in connection with any of our acts or omissions or any acts or omissions of our directors, employees, independent contractors or agents. 7.2 You acknowledge that neither South Pacific Software Pty Ltd nor our directors, officers, employees, independent contractors and agents has made any representation or given any promise or undertaking which is not expressly set out in your order or these terms and conditions in relation to the fitness of the Computer Hardware for any particular purpose. Subject to paragraph 7.3, we will not be held responsible and we expressly disclaim any liability whatsoever for any claims, demands or damages, direct or indirect, of every kind and nature, arising out of or in any way connected with your use of the Computer Hardware. 7.3 In respect of Computer Hardware, if you are a Consumer, to the full extent permitted by law and subject to any implied condition, warranty or right, or any Consumer Guarantee, which cannot be excluded by law: (1) We exclude all representations, warranties or terms (whether express or implied) other than those expressly set out in this Agreement; (2) We exclude all liability in respect of loss of data, interruption of business or any consequential or incidental damages; and (3) All implied conditions, warranties, rights and terms are excluded; (4) Where any condition, warranty or right is implied by law, or Consumer Guarantee cannot be excluded, we limit our liability for breach of, or other act contrary to, that implied condition, warranty or right or Consumer Guarantee, or otherwise to the extent permitted by law. In particular, to the extent possible, we limit our liability in respect of any claim to, at our option: (a) in the case of Consumer Goods: (i) the replacement of the Consumer Goods or the supply of equivalent Consumer Goods; (ii) the repair of the Consumer Goods; (iii) the payment of the cost of replacing the Consumer Goods or of acquiring equivalent Consumer Goods or (iv) the payment of having the Consumer Goods repaired, and (b) in the case of Consumer Services: (i) the supply of the Consumer Services again; or (ii) the payment of the cost of having the Consumer Services supplied again. 7.4 Our maximum aggregate liability to you under paragraph 7.3 is limited to the cost of the Computer Hardware you have paid to us. Indemnified”) harmless from and against all claims or demands of liability, costs, expenses, losses, losses or damages (including but not limited to direct, indirect, consequential, special, exemplary or punitive damages) however caused, including but not limited to reasonable legal fees and costs in connection with any claims or legal proceedings arising out of your use of the Computer Hardware or your breach of this Agreement (or both). 9.1 All copyrights, trademarks and other intellectual property rights (registered and unregistered) in and to the Computer Hardware belong to us and/or third parties. Nothing in this Agreement grants you a right or license to use any trademark, copyright or other intellectual property right owned or controlled by us and/or third parties. 10.1 Failure to exercise, or any delay in exercising, any right, power or remedy by a party does not operate as a waiver or abandonment of the right, power or remedy. A single or partial exercise of any right, power or remedy does not preclude any further exercise of that or any other right, power or remedy. A waiver is not valid or binding on the party granting that waiver unless made in writing. 10.2 If any provision of this Agreement is void, illegal or unenforceable, it may be severed without affecting the enforceability of the other provisions of this Agreement. 10.3 This Agreement are governed by the laws of New South Wales, Australia which are in force from time to time and both you and we agree to submit to the exclusive jurisdiction of the courts of New South Wales for determining any dispute arising out of or related to the use of the Computer Hardware or this Agreement. We may from time to time need to disclose certain information, which may include your Personal Data, to comply with a legal requirement, such as a law, regulation, court order, subpoena, warrant, in the course of a legal proceeding or in response to a law enforcement agency request. Also, we may use your Personal Data to protect the rights, property or safety of speedpix.com our customers or third parties. Where it is necessary to fulfil a contract with you. This includes where we collect your Personal Data to enable us to send you our goods or provide you with our services. Where you have given us valid consent to use your Personal Data. We will rely on that consent and only use the Personal Data for the specific purpose for which you have given consent. This includes where we email newsletters or send mobile phone notifications. We may also process your Personal Data where it is to further our legitimate interests which could include usage statistics, analytics and internal analysis so we can improve our services to you.